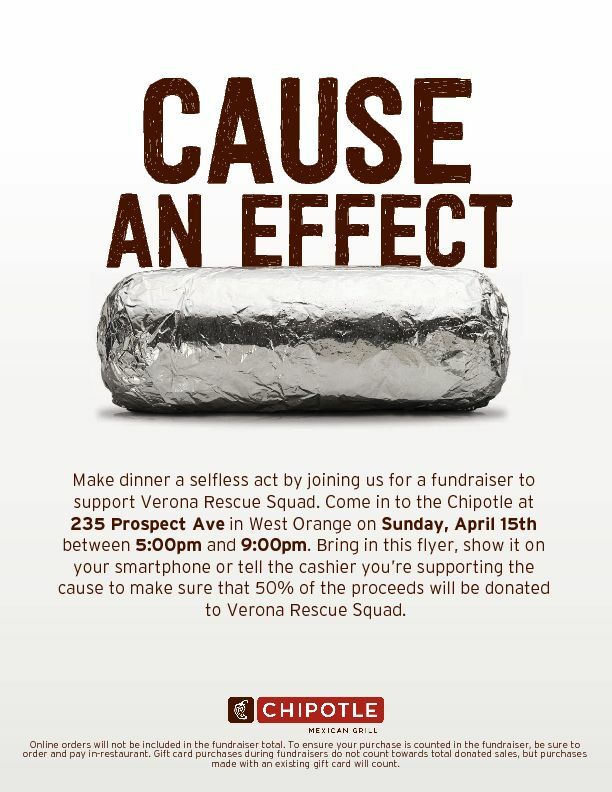 The Verona Rescue Squad will hold a fundraiser on Sunday, April 15, from 5 to 9 p.m. at the Chipotle Mexican Grill located at 235 Prospect Avenue, West Orange, in the K Mart Shopping Center. The Squad will receive 50% of the proceeds during that time. The squad will receive credit only if you tell the cashier and present the paper flyer when ordering or display the flyer on your smartphone. The flyer is available on the squad’s web site. Online orders are not included. Purchasing a new gift card does not count for this fundraiser, but using a gift card to pay for your meal does count. The Verona Rescue Squad is a non-profit volunteer organization that has been serving the needs of Verona since 1927. It relies on the generosity of Verona residents and businesses. It never charges for its services.